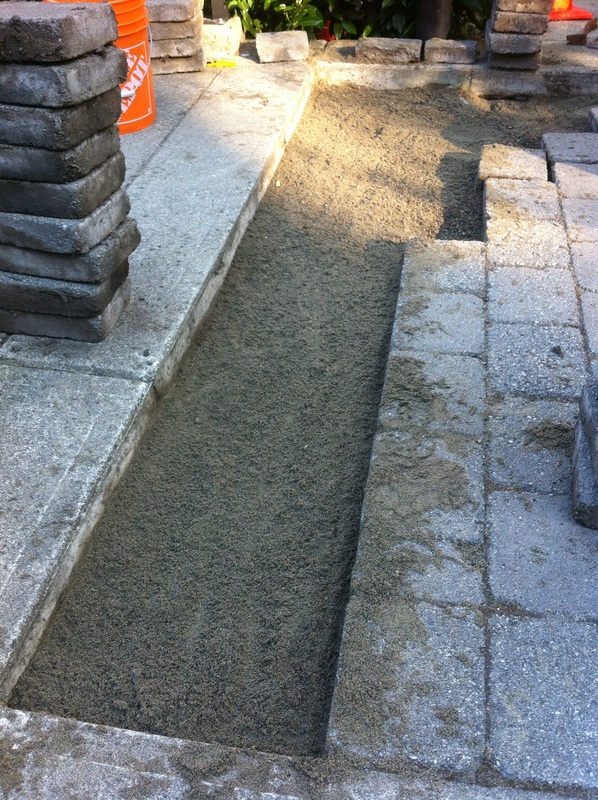 October 2016 - Proper Landscaping Inc.
2014, Kwantlen Polytechnic University. Sitting in my Red Seal challenge preparation course I was shocked to find out that landscape horticulture involved a lot of hardscape construction. One third of the exam, to be exact. And I wasn’t alone. Many of the other candidates also expected questions on plant families and specific plant species. Clearly, we were about to face our fears. Fast forward to August, 2016. 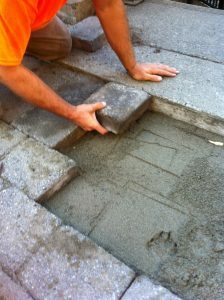 My boss needed help fixing a hazardous spot at the top of a walkway. Uh-uh. Here we go. No more textbooks. This was real life. Plus consider that I prefer working with live plants. I find hardscape materials too cold. This is what I learned as I faced my fears. A) Taking notes and pictures as you dismantle everything is very important. It makes it easier later when the stones go back in. Stack everything intelligently. B) Install mason sand (finely crushed sand) to build up the low spots. Park as close as you can to your work area. Our access was limited which meant bucket work. And lots of sweat. 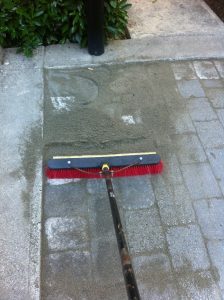 C) Use tamper tool to flatten the sand and even it out. 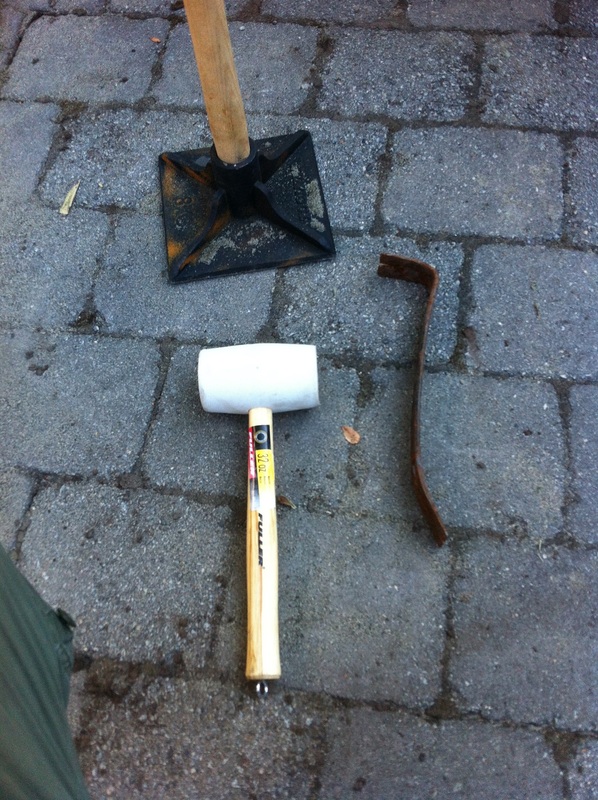 D) Re-install bricks and use rubber mallets to beat them into place. Pray they all fit. E) Cover the stones with mason sand and broom them into gaps. Mission accomplished. Sort of. The big hole was gone but since there was still a small tripping hazard, we will have to go back and dismantle a larger area. Maybe I will call in sick. Or go and face my fears. 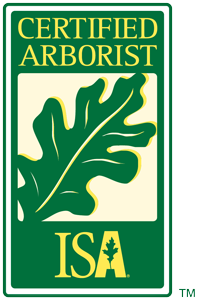 Fall is incredibly busy for landscape companies. Now there is extra help in the form of a new Stihl blower. Introducing BR700. It helps to have a good relationship with your dealer. That’s how my employer recently got hooked up with a test unit of this brand new backpack blower from Stihl. Personally, I get more excited by plants than machines but product testing can be fun. Testing this bad boy was fun. So was writing a blog post about it. 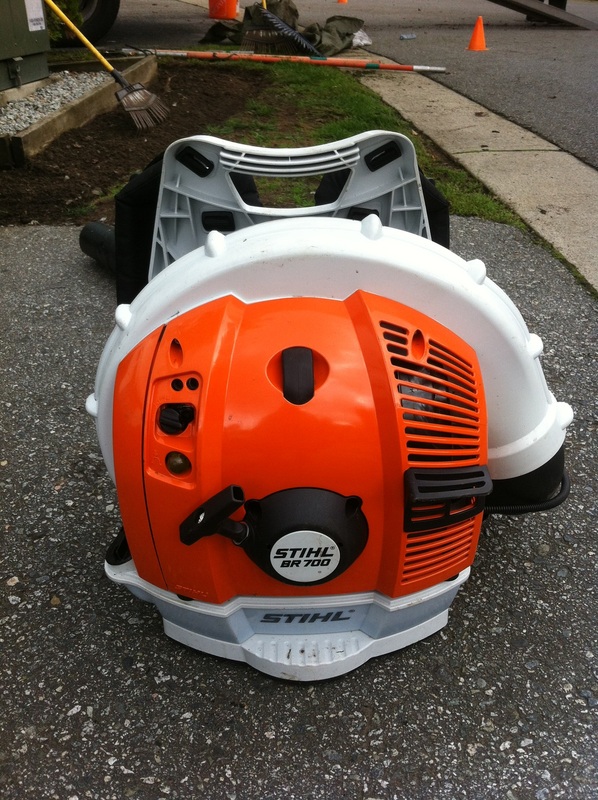 Stihl’s brand new backpack blower BR700 is a big gun! It’s their biggest, most powerful blower. 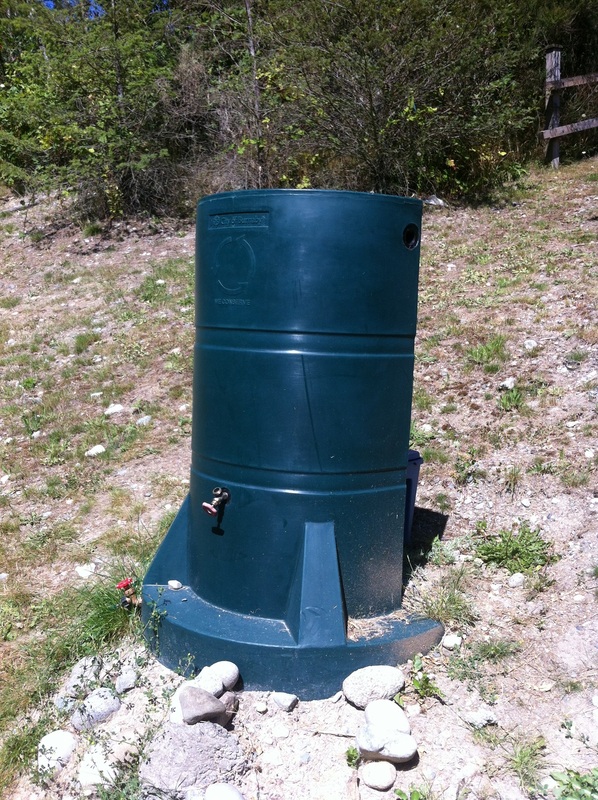 This is the kind machine residents in Vancouver’s West End, where blowers are banned, have nightmares about. Landscapers will be asking Santa for one unit under their trees. 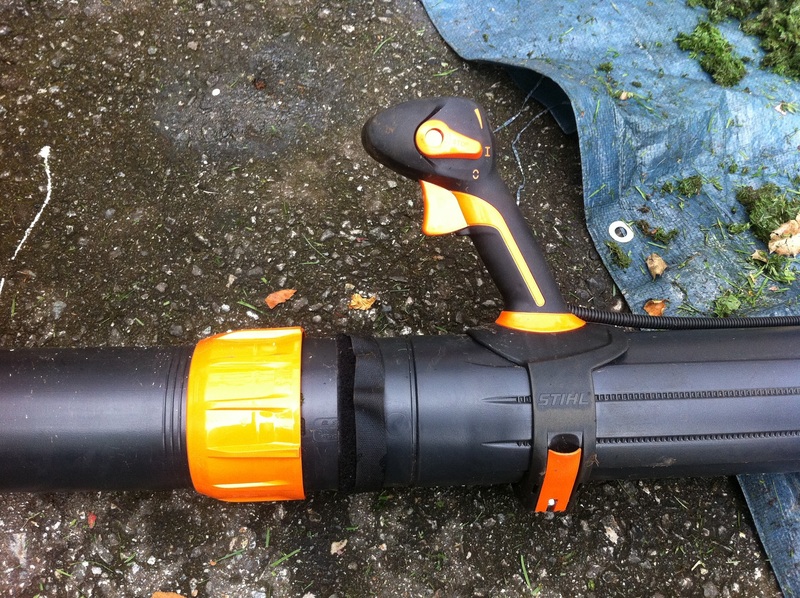 You will notice the huge adjustable telescopic tube with an adjustable control handle. 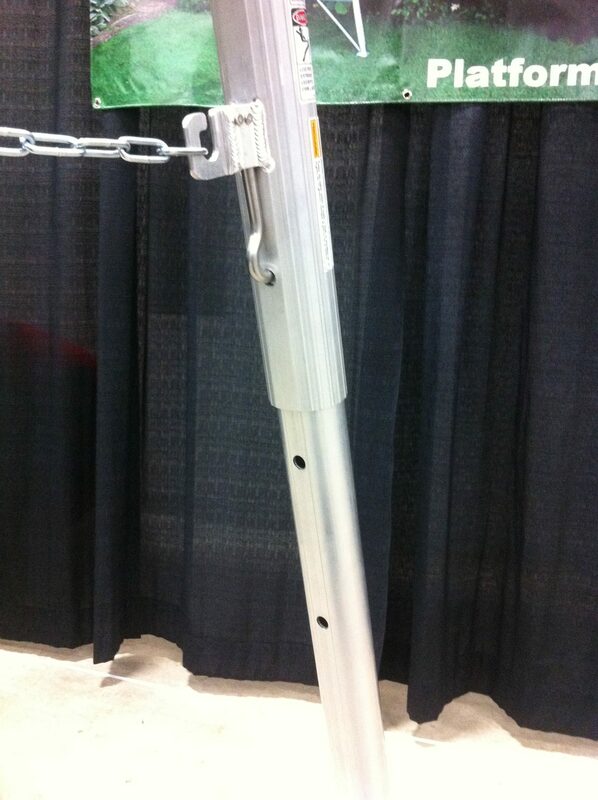 This allows workers of different heights to adjust the unit. It’s quick and easy. I love this feature. 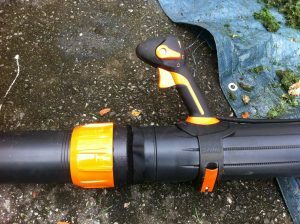 The air volume at the nozzle is 30 percent more than for its older sister blower BR600. 1550 cubic meters per hour vs. 1150 cubic meters per hour. 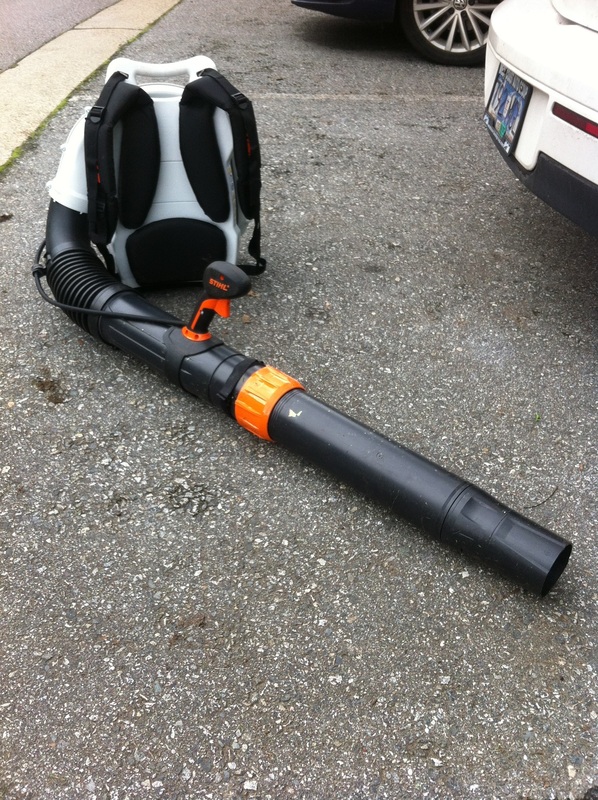 This is why the blower is ideal for large properties and tough landscaping tasks. Nozzle attachments are available for more directed flow. One word of caution. Blowing out leafy beds with this beast might lead to soil loss. The BR600 might be better suited for this. If you have to push leaves down a road the BR700 is great. 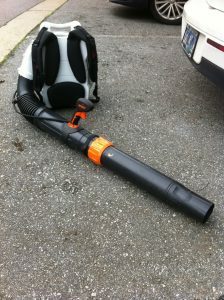 After testing, every crew got one of these big boys to help out with leaf clean up. The BR700 is powerful and a pleasure to use. I highly recommend it. 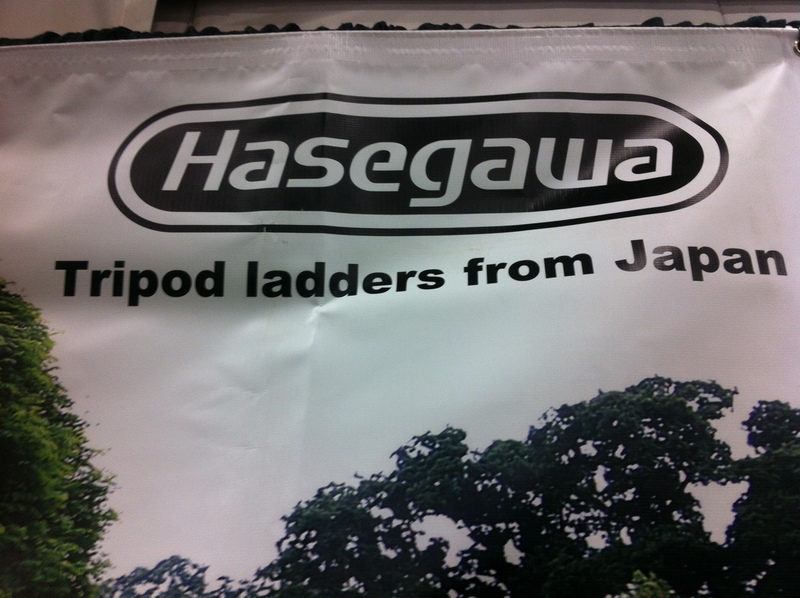 Hasegawa landscape tripod ladders are beautiful! 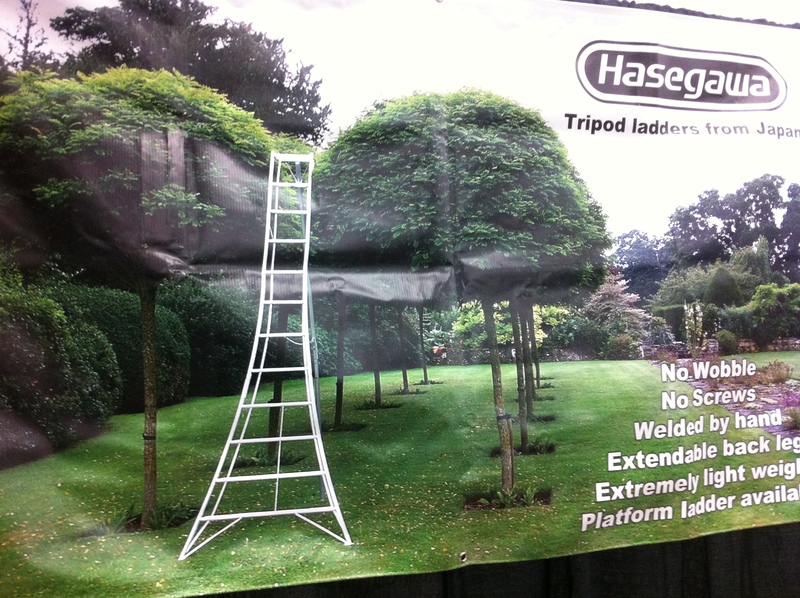 In late September, while strolling through the CanWest Horticultural Show trade floor, I ran into a Hasegawa ladder booth. Then it hit me. Vancouver Sun’s Steve Whysall had written about these ladders and how he dismissed them because of the cost. Now I had them in front me to try out. Great! 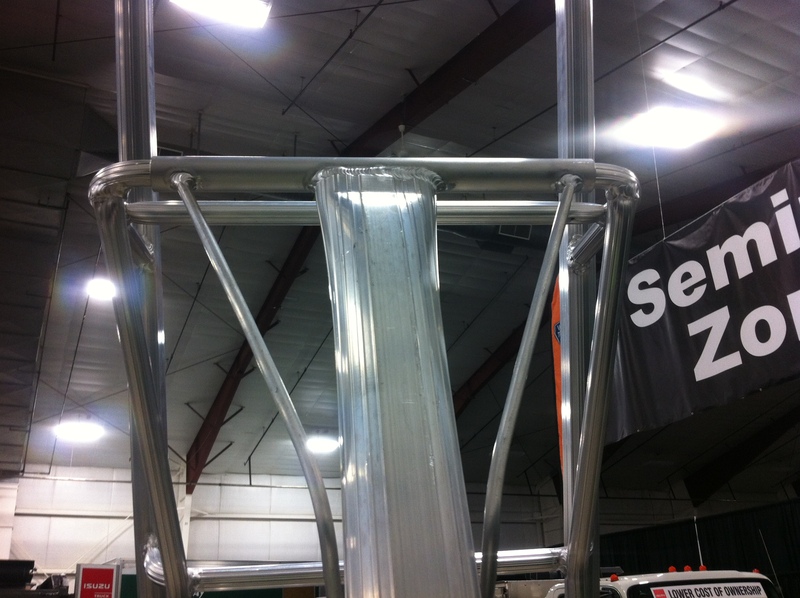 1.These ladders are really light. The ten foot version was easy to move. 3. The third leg adjusts easily with a spring-loaded pin in 6″ increments and connects to the body with a chain. 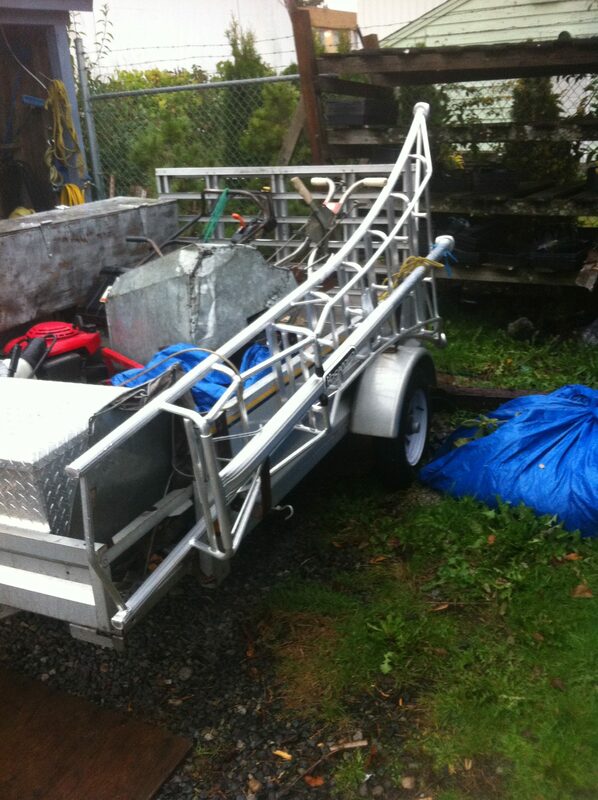 This works great when working on uneven ground. 4. 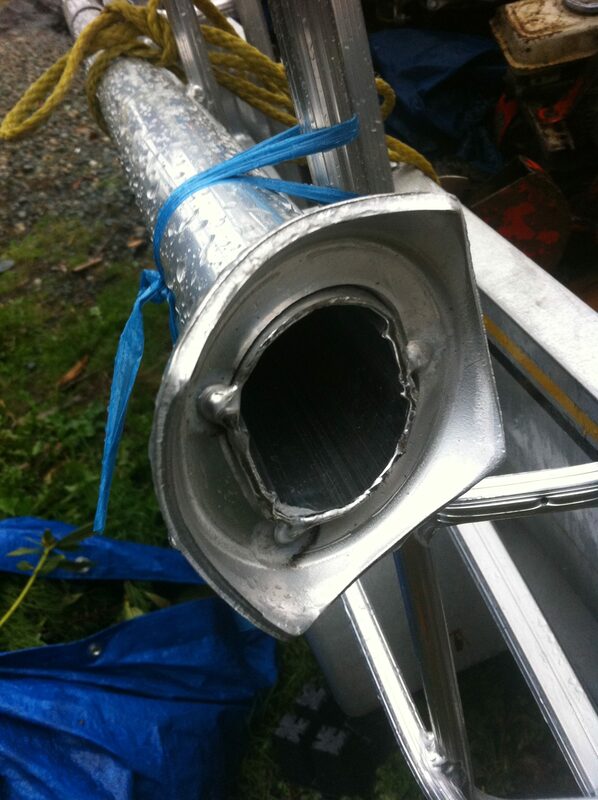 There are no bolts to tighten; all joints are hand-welded. 5. The ten foot version retails at $435, which is expensive. Steve Whysall was right. I would worry about this ladder going missing off my truck. 6. Designed in Japan, production has now shifted to China. What hasn’t? 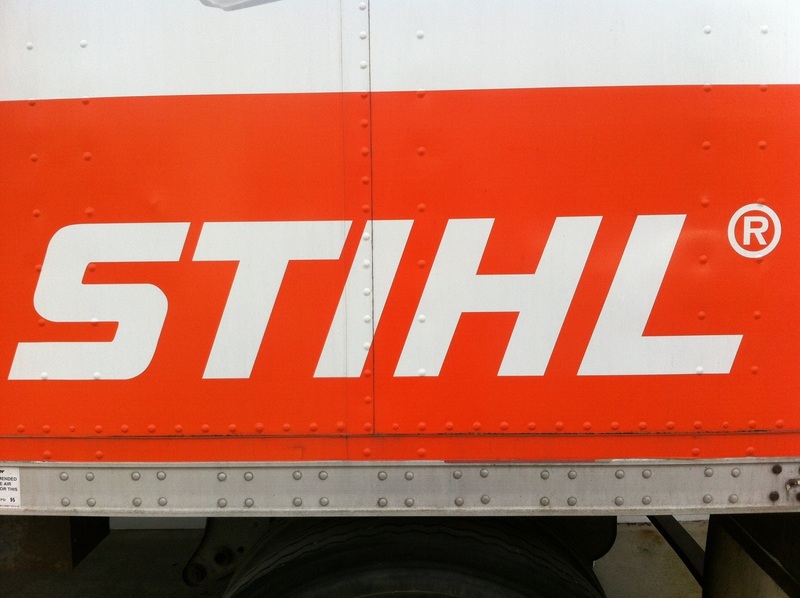 Allegedly production conforms to Japanese Industrial Standards. 7. The only landscaper I know who has a Hasegawa tripod ladder attached to the side of his trailer is Japanese! 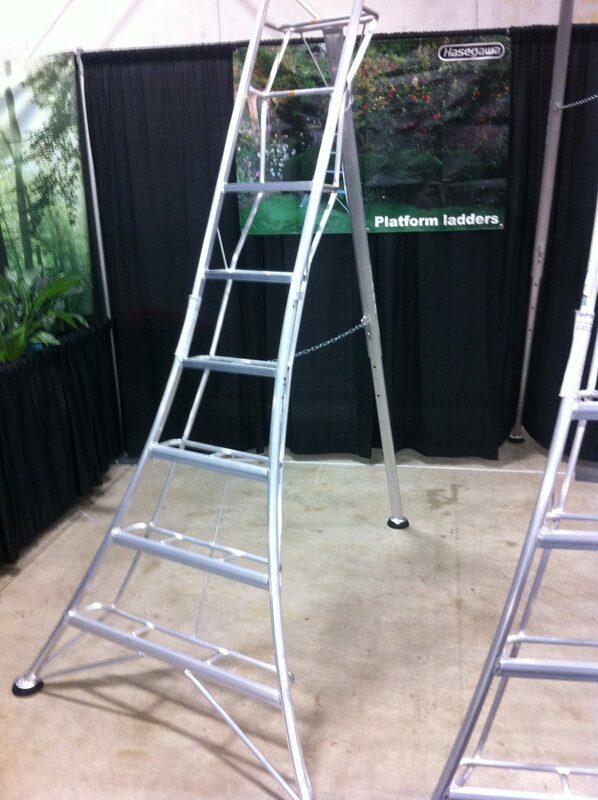 If your budget allows, buy this tripod ladder for your tree, garden and landscape work. I will. In the future. Call Steve at 778-988-7303 with questions. Disclaimer: always use ladders safely! 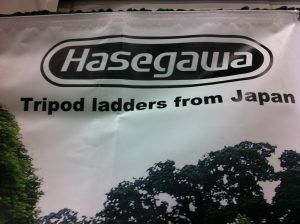 I am in no way associated with Hasegawa ladders or their distribution. The review is based on my observations at CanWest. There are three pruning actions associated with rhododendrons. One is the removal of spent flowers (trusses) and any diseased or dead wood. 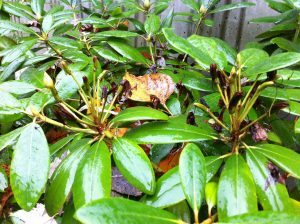 Most rhodos produce seeds and you can get your rhodo to concentrate on growth by removing the spent flowers. Do this soon after flowering before the new buds get big and set. I prefer hand pinching. Just be careful so you don’t injure the buds below. Use hand snips if you are worried. 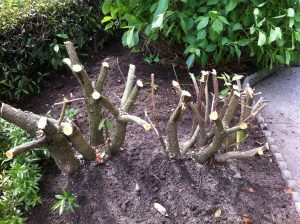 The second pruning action is for shape. 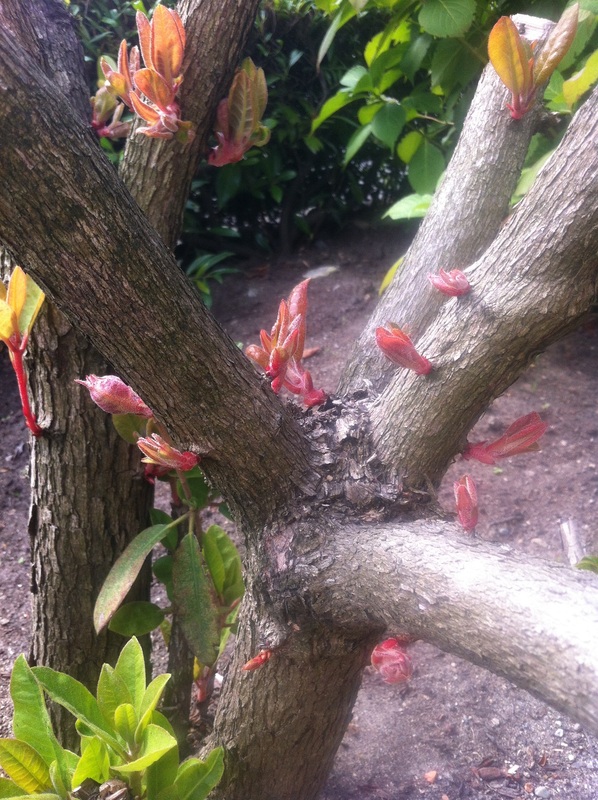 Just follow the branch down to the last whorl of leaves you want to keep and cut just above those leaves. This is what I recommend to clients who wish to keep their rhododendrons from getting too big. 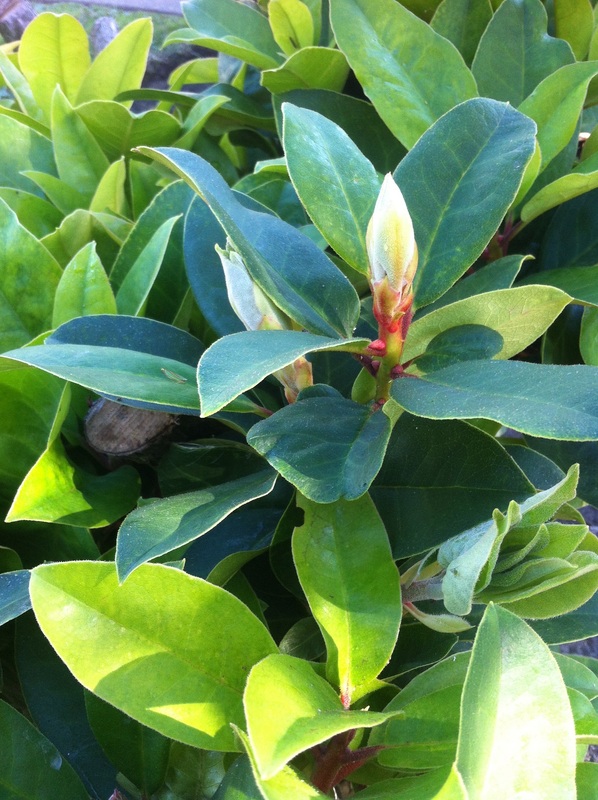 But what if your rhodo is too big? Now what? 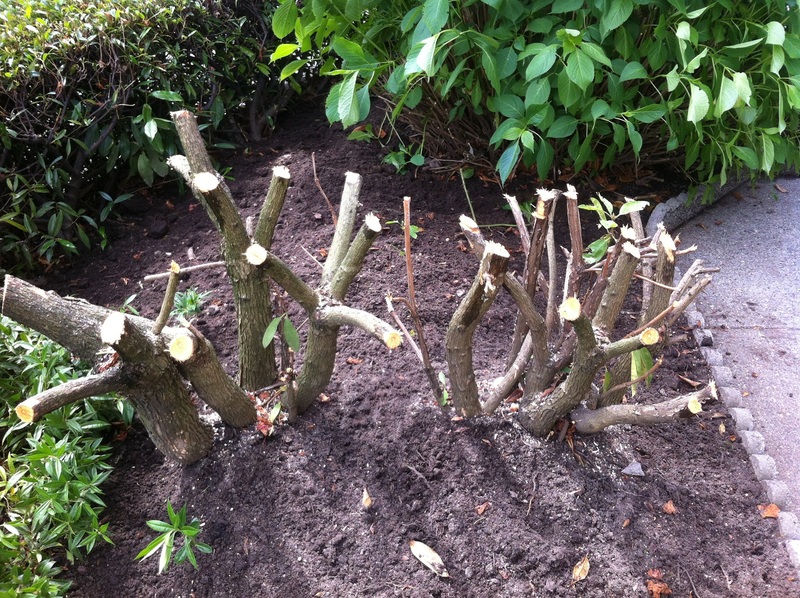 In this case we employ pruning action three: rejuvenation, which sounds better than renovation. This involves bravely making large cuts and significantly reducing the plant size. This works because rhodos are special. 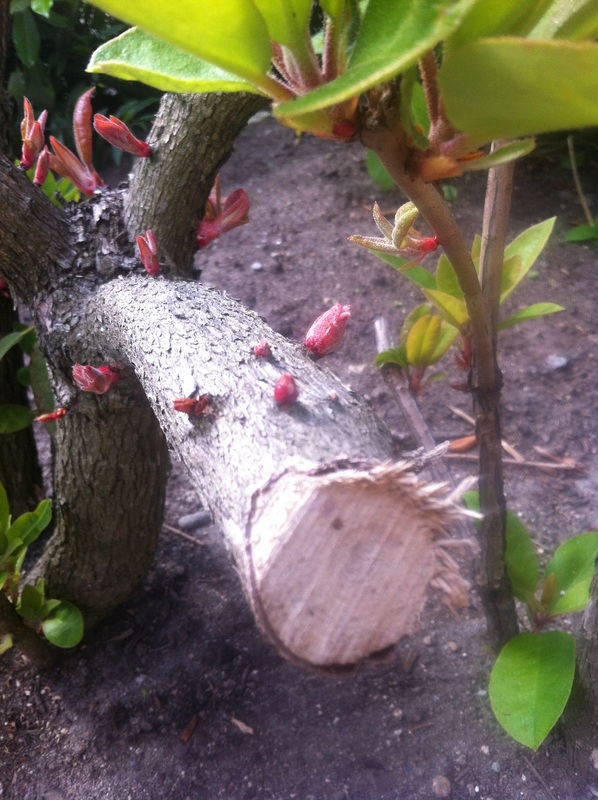 Examine their bark and look for tiny pink dots. Those are latent buds. Always aim to cut above these buds. Best case: cut above a cluster of latent buds. Then watch. 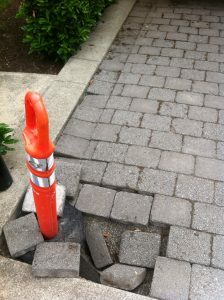 Here is one example from my work site. 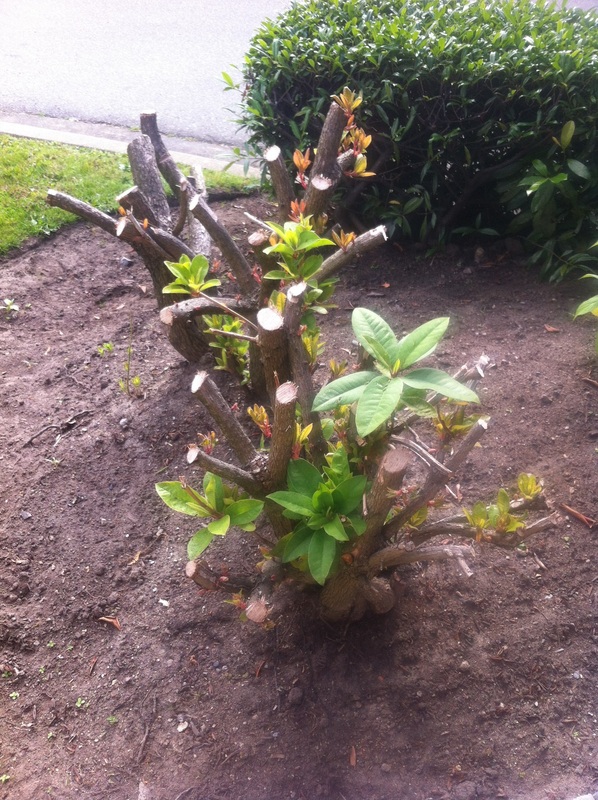 This rejuvenation pruning was done at a corner unit where there was a problem with vehicle sight lines. Drivers couldn’t see properly when turning. So out came the saw as soon as the request was made. This was the result. Not much to look at right after pruning. Reduced to 30%. Rhododendrons are forgiving plants. Pinch off flower clusters (trusses) soon after flowering and prune for size. Bravely make big cuts if rejuvenation is required. References: Fine Gardening, issue 86. There she was. A lovely mother of two busily tending to her community garden plots. It was a sunny morning and the plants were in need of water. 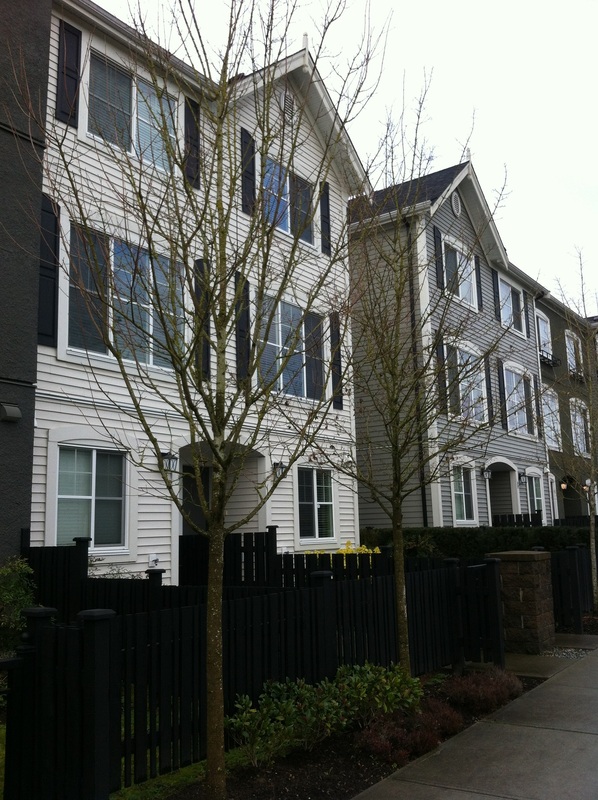 The two plots are small but her strata council has approved the construction of one more plot. It wasn’t easy, nor quick, but there will be more space for growing stuff. Not every strata council is this accommodating. 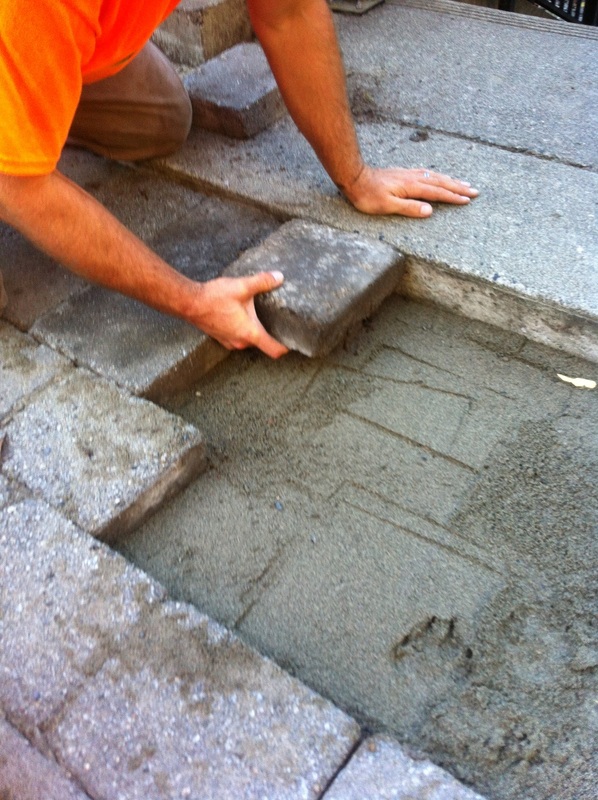 Most condo patios are either too small or don’t receive enough sunlight for serious growing. There is a water barrel for watering. All members take turns watering and taking care of the plots. The harvest is shared among them. Community. It is clear that there is more and more interest in these gardens. 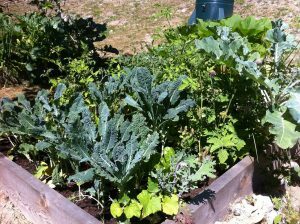 A mother of two is happy to know that her vegetables are organic, she can save a bit of cash and use the plot to teach her kids about food. This is nothing new. 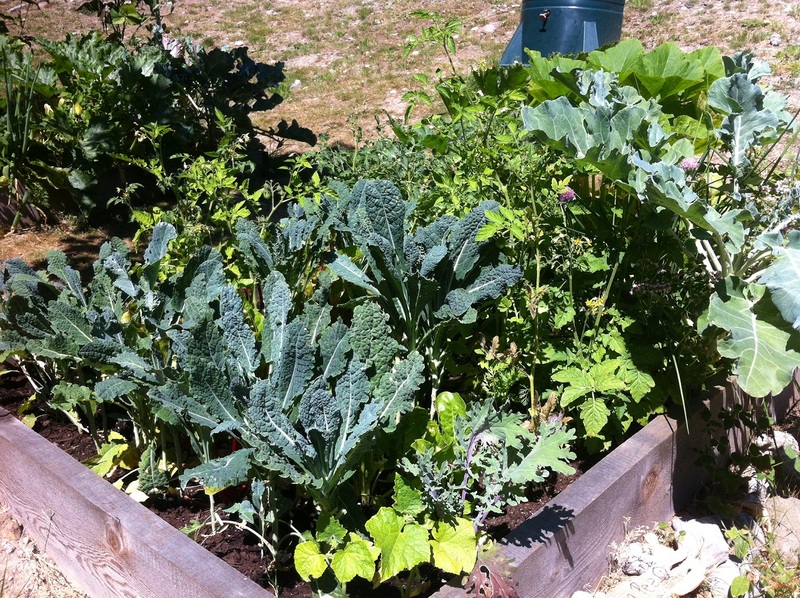 Michelle Obama famously planted a kitchen garden at the White House to promote the value of urban agriculture. 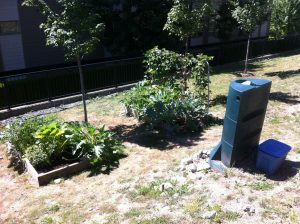 Several years ago I had a community garden plot in the Burquitlam area of Coquitlam. Busy at the time and annoyed with one of the garden directors, I gave up. Now I wish I hadn’t. As The Globe article mentions, during the world wars, the government encouraged people to plant food gardens in all available urban spaces. 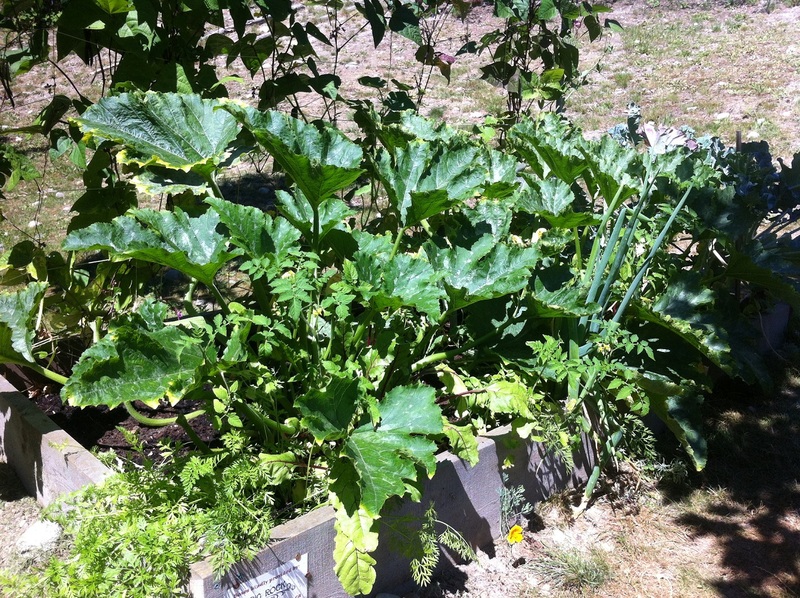 I can’t wait to see how the third garden plot develops. 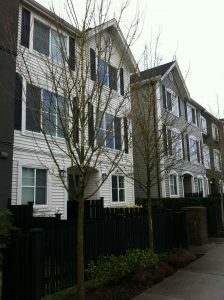 Working in Langley, BC on an early spring day, I noticed a low tree branch obstructing an entrance. This is called ‘landscape eye’ and the subject of an earlier blog post. So out came my snips and the branch was cleared out of the way. In seconds. Then the ‘bleeding’ started! In seconds. Oops. I noticed the samaras and only then realized this was a maple tree. The actual species name escaped me because this was our first encounter. I would later look it up and a blog was born. Maples are ‘bleeders’. They lose large amounts of sap when pruned at the wrong time. This is the maple rule: prune before Christmas or in summer. This was early spring so the sap ‘bleeding’ was noticeable. One week later it had stopped. Thankfully. 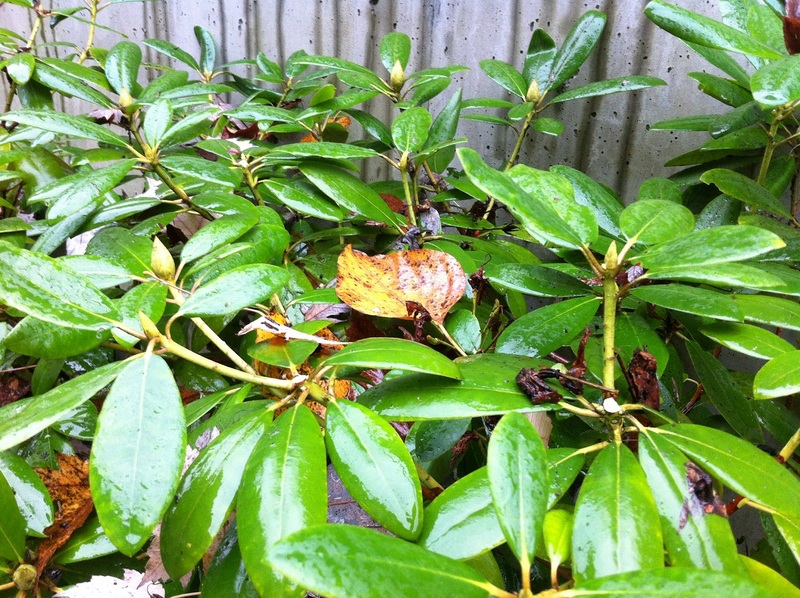 If you prune in summer, make sure it’s not under drought conditions. Under drought conditions, trees close their leaf openings to avoid water loss. This means that carbon dioxide can’t enter and food can’t be produced. The tree lives on reserves stored in its branches. If you prune too many branches off, you can starve the tree. Campestre means ‘from fields’. 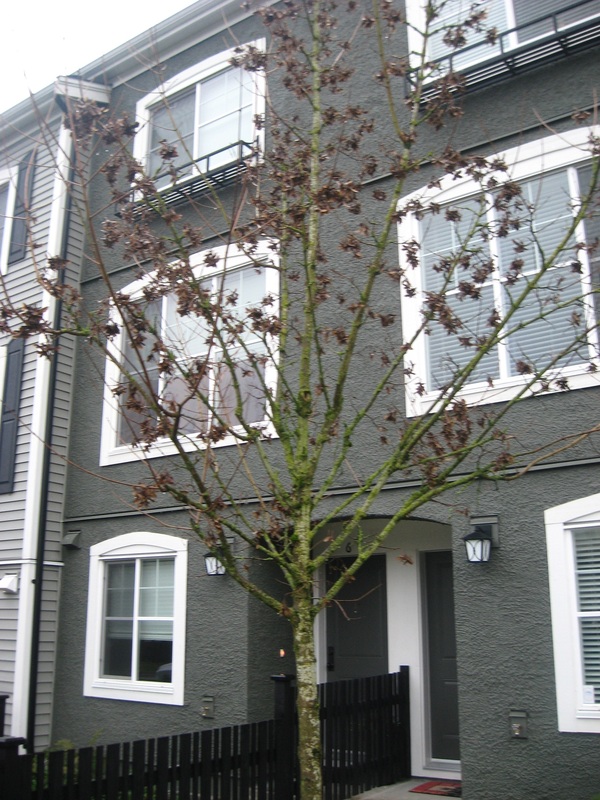 It is an attractive medium-sized deciduous street tree. 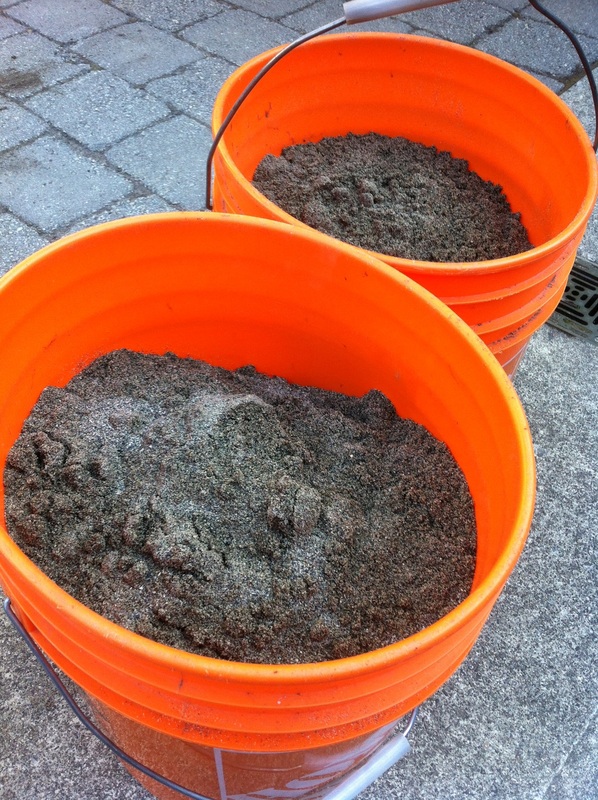 It tolerates urban conditions like drought, clay soils, air pollution and soil compaction. It prefers full sun to part shade conditions. 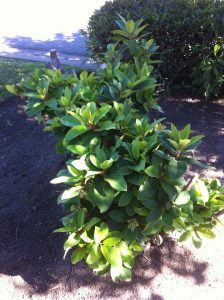 It has yellow fall color and can be pruned, sometimes even harshly. In Europe it’s shaped into hedges. The leaves have five blunt lobes. 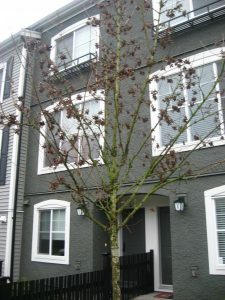 This is a low-maintenance street tree. The only work I have done on these trees is walkway clearance. 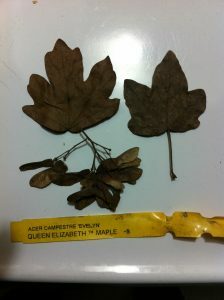 I have yet to encounter this maple species on other sites. Have you seen Acer campestre?